Because Stencyl is powered by Box2D, collisions happen automatically, as if every object existed in “real-life.” For the default cases, no action is required on your part to make collisions happen. However, what if you only want certain collisions to happen? For example, if any enemy shoots a bullet, the bullet should only collide with the player, not other enemies. To do this, you have to set up Groups. Collisions happen between groups that are set up to collide with each other. Conversely, collisions are ignored between groups that are not set up to collide with each other. You can set up Groups in the Settings dialog. Click the Settings button to open the dialog. 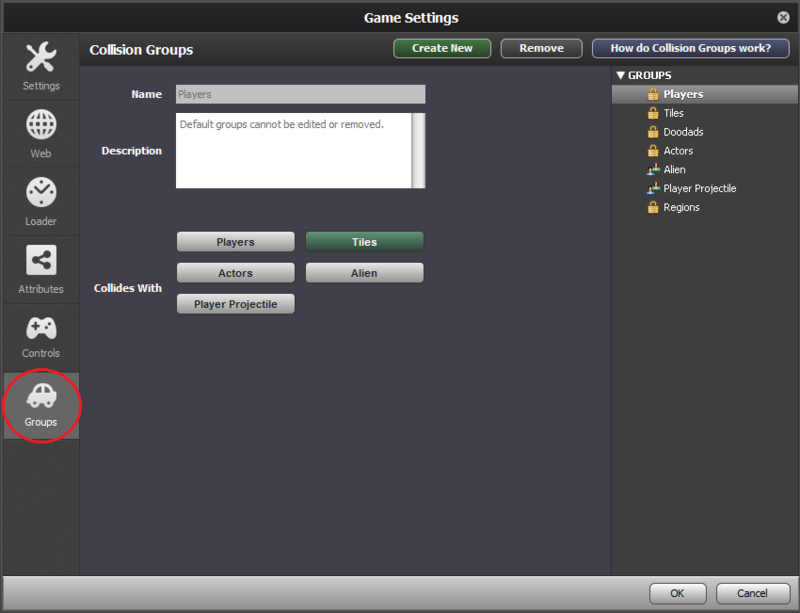 Next, click the Groups button (shown below), and you'll see a dialog that shows the Collision Groups in your game, the green Create New button that lets you make a new Group, and other settings. You can set an Actor's collision properties, and specify the group it belongs to, in the Properties page of the Actor Editor. 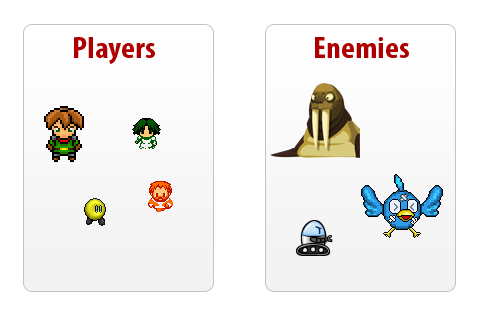 Every Stencyl game starts out with a default set of Groups to help you get started. These groups have a lock next to them. Default groups cannot be edited or removed. By default, Doodads and Regions never get involved in collisions. 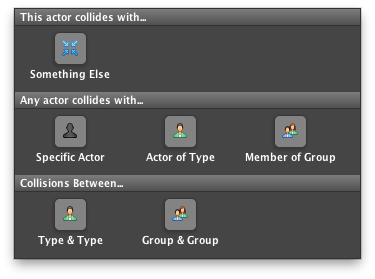 They may be useful if you want a quick way to designate an actor as "non-colliding"
As we talked about in the Animations section, Actors can take on different Animation states. For each Animation state, the Actor can have different collision bounds. For example, if a character is standing, he may be taller. If he’s ducking, he may be shorter. You can place an arbitrary number of these shapes, in order to form more complex ones. In this example, we’ve made an “L” shape using 2 boxes. What if you want to detect collisions, without the shapes actually colliding? 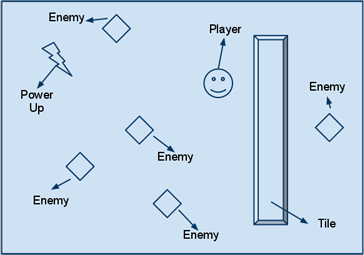 For example, in Tower Defense games, the towers shoot at targets that come into range. You’d use Sensors to make this happen. Sensors are special kinds of shapes (a yes/no flag on any shape to be precise), in which an Actor does not physically collide with another Actor, but still detects the collision. Just check this box in the right-hand pane of an Actor’s Collision Page to make a certain shape a Sensor. Use Events to handle collisions. By "handling", we mean responding to collisions with logic. For example, if a Fireball crashes into Mario, Mario will die. We support the following collision events. Regardless of which Event you pick, you’ll typically see a block similar to this. 1st actor always pertains to the first actor in the “sentence.” The same goes for the 2nd actor. Then, when this kind of collision happens, the 1st actor will refer to the Hero and the 2nd actor will refer to the Button. Just in case, you didn’t know, you can drag the “1st actor” and “2nd actor” blocks out and use them anywhere within this event. For any kind of collision, you can check on 3 additional bits of info. Exercise: Stomping is one common use case for collision sides. Something is "stomped" if it was hit from the top. Can you think of other use cases for collision sides? What is this “colliding shape” business about? It stems from the ability to override an Actor’s default group on a per-shape basis, so that a particular shape can take on a different group. When working with the “Collision Group for colliding shape” block, be sure to compare groups directly, rather than comparing the textual name of the Group, which can lead to bugs and crashes. You can find all Group and Type “getter” blocks under Actor > Properties. Last but not least, you can grab exactly where collisions happened. This isn’t done very often, but it’s here in case you want to do any additional logic based on the collision location. Thanks to physics, collisions are automatic. Groups help you filter out collisions by specifying who collides with who else. Also in the blocks, there exist a block that says "<actor> is colliding with <actor>"? i don't see it. And if 2 actors are overlapping? There is. I recently needed something much the same when I was getting some code ready for my game. If you go into a Behavior or an Actor's Events section, and choose to Add Event, under Collision, there is an option that says "Any actor collides with... Member of Group". 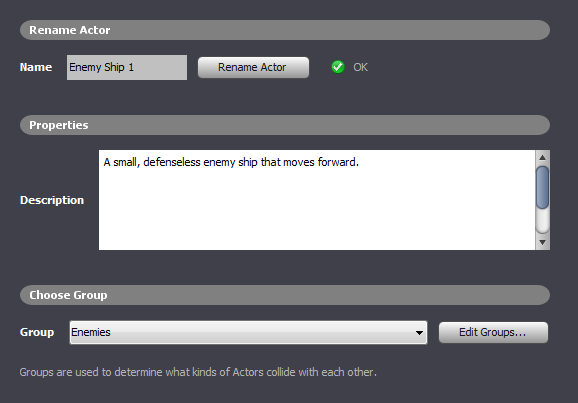 This will allow you to specify "Self" as the "any actor," and choose any one group to cause the collision effect with. Of course, it has been a while and you may already know this, but hey, it's out there for people to use now. Okay, I have a problem here. I have an actor that can fly, which normally would require less coding, but I have a system made to set gravity on and off which requires a boolean. This boolean is one which detects whether the actor is on/off the ground, and I have it set up to make it only become true when up is pressed. Is there any sort of block which detects if an actor is currently in collision with a group? And if not, will you add one later on in Stencyl? So as a quick test of my understanding, say I wanted to make a character swing a sword. I would make the animation and perhaps use two collision shapes on the attacking sprite, one for the character and another for the slash effect, and give the slash effect a separate collision shape (say, a circle) and make it a sensor and part of a different group, so that if the slash collides with an enemy, the enemy is damaged, but the player sprite can still be damaged even if attacked during the attack animation...sound about right? Hello, I wanted to ask about the collisions, since I seem to have some trouble with them. YOu see,for some reason when I move my character to the right, a collision isn't made, and thus the character doesn't lose health. However, it sometimes does detect the collision... but about 40 px off to the right. @speeddemon1234 - Thanks for your feedback. We agree that the game attributes interface is in need of improvement and will do so in the future. 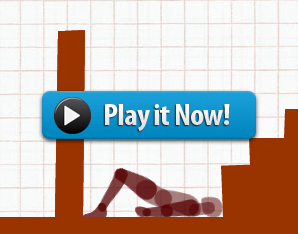 How can I make obstacles in my game? This program is great compared to game maker 2.1 and The game factory 2 but there needs to be a way for you to get to the ALL the game attributes and be able to chose from one and not have so much grid and guessing to do on creating your games my game right now is set up but i have no idea how to get anything to happen in it.